I always knew Kurt Cobain was fashion-forward, but I never knew how truly daring and innovative he was. Check out this pic: he is sporting not only a book (A YEAR IN THE LIFE OF THE MAN WHO FELL ASLEEP, by GREG STEKELMAN), but also the only accessory that sexifies a man even more than a book--a kitten. Combining them? Pure awesome. Are all you men paying attention out there? this book was written 7 years after Kurt Cobain died! 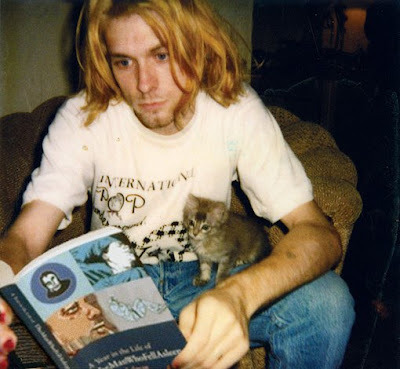 that's what is really amazing about this photo, kurt cobain never touched this book in his life! yeah, how could he have touched this book since it was published after his death. Total scam!